Only minutes away from Belfast city centre, the award winning hotel, Malone Lodge, is set along the Queens University Quarter in South Belfast. The hotel boasts 102 bedrooms and apartments, as well as a 240 seater event and conference room. The luxurious interior of the hotel includes the foyer which sits at the heart of the hotel. TheTaste are giving readers the chance to experience Malone Lodge from only €20. Enjoy a Prosecco Afternoon Tea at Malone Lodge for only €25 per person. Offer can be used Monday – Sunday. Enjoy a 3 Course Dinner for Two with a Bottle of Wine at Malone Lodge Belfast for only €55. Offer can be used Tuesday – Saturday. 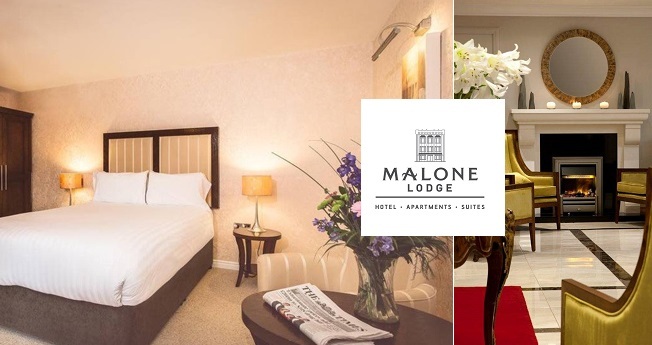 Treat Yourself to a Northern Escape – Overnight Stay for Two People at Malone Lodge Belfast with Breakfast, Dinner and a Bottle of Wine for only €149. The executive rooms at Malone Lodge are even more spacious than the Classic rooms. The large pillow-top beds, duvets to die for and luxurious decor are only some elements that make this overnight experience so desirable.